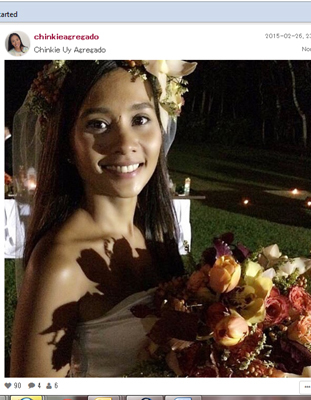 Kitchie Nadal’s wedding to Carlos Lopez may not be the most grandiose celebration we’ve seen of late, but it definitely inspires many grooms and brides to become more wise and creative in picking their wedding details. It’s very common to see lavish weddings and celebrations in showbiz. But sometimes, a penny-wise couple comes along and floors people with a beautiful ceremony that doesn’t need a village and millions of pesos to set up. Among those rare pairs is singer-songwriter Kitchie Nadal and Spanish NGO worker Carlos Lopez. 1. IT’S ALL ABOUT THE BRIDE, NOT THE DRESS. It’s because of the fact that weddings happen once in a lifetime that many brides choose to go all out when picking the perfect gown. But for the 34-year-old “Wag Na Wag Mong Sasabihin” hitmaker, it’s enough that she’s dressed up in white on her big day. Wedding tip: Buy your dress off-the-rack to save on cash! 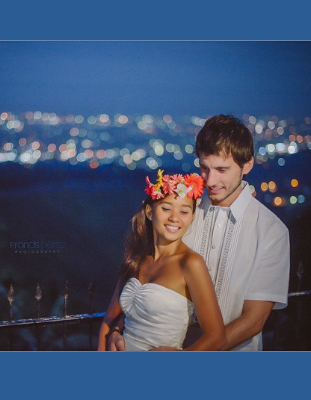 One of Kitchie’s close pals, music photographer Niña Sandejas, revealed in her blog that the bride purchased her strapless satin gown at a boutique in Makati for only Php799. “It was my first try and it fit me perfectly!” Kitchie supposedly told Niña, proving that women don’t need to spend thousands for a bridal gown. The dress, which had a lace back detail, was worn for the wedding ceremony held in Hacienda Isabella in Tagaytay on February 26, and the wedding party in Alta Vista Golf & Country Club in Pardo, Cebu City, on March 1. 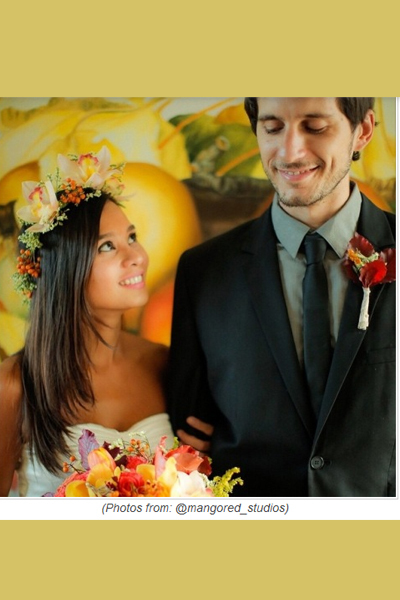 In lieu of fancy jewels, Kitchie opted to accessorize her fresh bridal look with equally-fresh flowers. Nothing could have complemented her tanned skin better than a crown of lilies that matched her bouquet of autumn-colored roses. 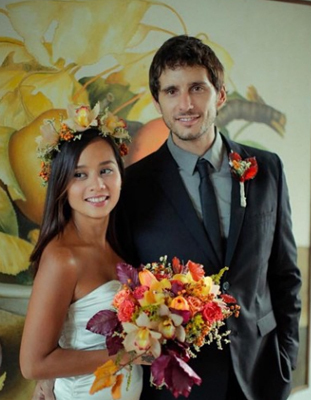 Carlos’s corsage matched Kitchie’s crown and bouquet, which were arranged for her by florist and event stylist Teddy Manuel. For the after-party in Cebu, the former Mojofly vocalist’s choice of flora were ox-eye daisies in orange and yellow hues. Summer is in the air at Carlos and Kitchie’s poolside wedding party. Apart from the flowers, her only adornments were a pair of stud diamond earrings and three beaded bracelets, which are far more sensible choices. 3. IN BEAUTY, LESS IS MORE. If you’ve got the skills and the tools, why not do your own bridal make-up? Kitchie faced the altar with natural-looking make-up. Her “barely there” look turned out to be a perfect match for her dress’s sleek silhouette. 4. GET CRAFTY AND GO DIY. 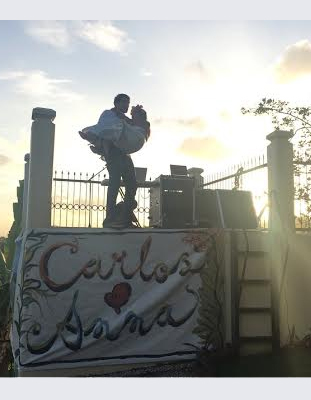 It pays to have artist friends, as shown on this adorable wedding banner made especially for Carlos and Kitchie—whose real name is Anna Katrina. 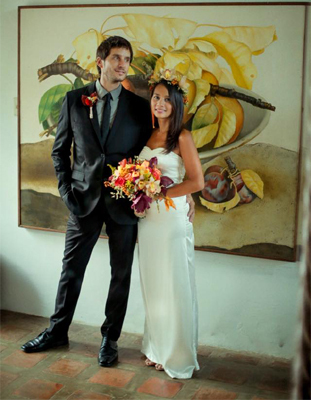 Singer-actress Isabella Gonzalez was among the guests at the intimate wedding celebration. This hand-painted cloth that Carlos helped install with his friends decorated the viewing deck, which was turned into a stage/DJ booth where Kitchie and her musician friends (including Budoy of Junior Kilat) performed. 5. TRY TO KEEP THINGS SMALL AND SIMPLE. 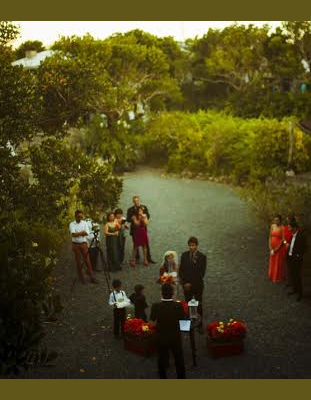 Having a quiet and intimate wedding doesn’t mean that you don’t treat the occasion special. In fact, keeping your guest list small makes the event more solemn and meaningful for you and for everyone. Like Kitchie and Carlos—who only had eleven (yes, ELEVEN) of their closest friends and family with them during the ceremony in Tagaytay—couples can cut costs in their own wedding by minimizing the number of people in their entourage. That way they can allocate their budget for a bigger party—like the Lopezes had in Cebu—which could accommodate more people that they want to celebrate the special occasion with.